Evaluation is one critical element of an Opportunity Culture, used primarily to guide development and career opportunities. 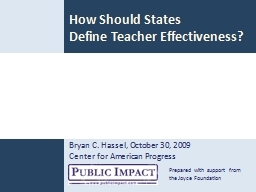 But previous teacher evaluation reforms were built for the one-teacher-one-classroom model, and few districts have provided a robust, sustainably funded way to connect teacher evaluation with career opportunities. In contrast, in an Opportunity Culture, few teachers work alone most of the time. Because most Opportunity Culture teachers collaborate with colleagues in teams, they see one another’s thinking and actions up close. These colleagues and team leaders are in the best position to give one another valuable and accurate feedback to support their improvement throughout the year. All of this changes both the content and process of teacher evaluation—for the better. But districts and states must deliberately change evaluation to match the team, team leader, and extended-reach roles that are common in schools using Opportunity Culture models. 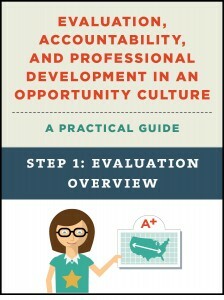 This guide will help education leaders align evaluation and its uses with an Opportunity Culture and similar school models and career paths—successfully and at a low cost. The project, prepared for ConnCAN and 50CAN, aims to get “under the hood” of the teacher evaluation systems in 10 sites, including states, districts, a charter management organization, and a school of education. The project collects information about these emerging systems in a single place, using a consistent format that allows users to look across sites and see where organizations are proceeding in similar ways, and where approaches diverge. The project also includes links to dozens of resources from the 10 sites such as system overviews, detailed policies and guides for teachers. Could redesigned K-12 teacher tenure actually improve student learning? Could it help to grow the size and power of an elite teaching corps that reaches far more children? This paper examines lessons from higher education and the civil service and applies fresh thinking to offer new “elite” and “inclusive” tenure designs and a framework for policymakers who want to make tenure meaningful. Today, K-12 tenure is granted to nearly all teachers, with almost no criteria, and within the first few years of teaching. As a tool to strengthen our nation’s schools and children’s prospects, tenure has failed. The culture of tenure and costs of associated pay scales also have created a nearly universal glass ceiling for the best teachers. But discussions about tenure nearly always fall into the “keep it or scrap it” camps. This paper inserts level-headed thinking into the K-12 tenure debate. A brief presentation, prepared for the Joyce Foundation, outlines key findings. In successful turnarounds, staff dismissals are typically small in number, and focused on employees who cannot or will not make the radical change necessary to dramatically improve performance. In this report, written by Julie Kowal, Jacob L. Rosch, Emily Ayscue Hassel, and Bryan C. Hassel, for the Center on Innovation and Improvement, we examine the research base on performance-based dismissals in other sectors to offer strategies for leaders in turnaround schools. A PowerPoint summary of the report is available here.